and captures the immense beauty of our fragile natural heritage. Born in Chile, raised in Brazil and now based in France, Jorge Camilo Valenzuela is a citizen of the world. A professional photographer and filmmaker, he works across the planet, mostly in tropical rainforests. Jorge shares his love of the world’s natural heritage through his photography books published with National Geographic and Éditions Vilo, and his photo and sound exhibits in places like Paris, Tokyo, Barcelona, and Santiago. His photo projects related to the environment and its preservation require both a mental readiness to face every eventuality and the physical determination to survive in the field. It is in this mindset that he immerses himself for months in an often hostile environment that allows itself to be apprehended only through humility and patience. 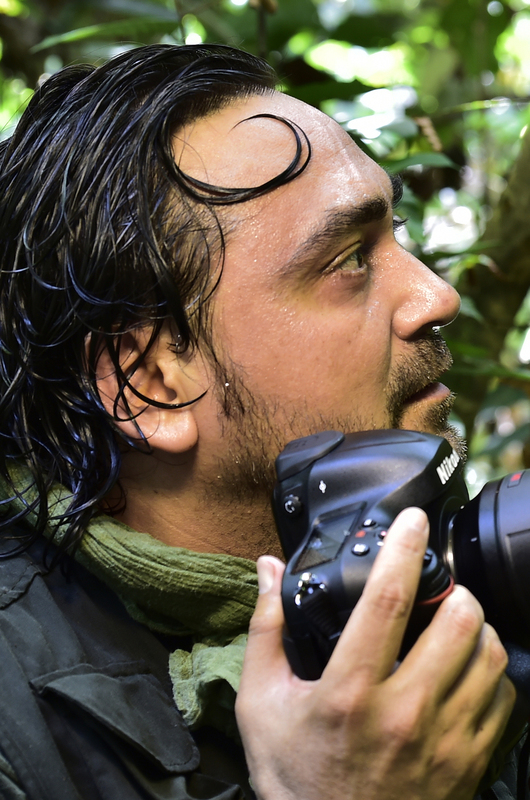 Jorge is one of a handful of photographers and filmmakers who travels to the most remote, dangerous jungles in the world—the Amazon, in Borneo, and Africa—and remains there for several months to offer us the opportunity of discovering their unique ecosystems. Jorge is a storyteller, a witness to what is going on in the world. When he travels, it is with a restless eye, always on the alert, ready to capture and immortalize precious moments of life that he converts into images. His goals are to raise awareness of how important it is to preserve our flora and fauna, to promote education on the environment, and to open horizons to discover the immense biodiversity of our planet.